The Highlands and Islands tour (Tour C) is confirmed as advertised. interested in joining this tour. own itinerary and see more of Scotland after the Congress. With Scotland being the home of golf, guests can extend their stay to include a round or two on some of the country's finest golf courses - St. Andrews, Gleneagles, Carnoustie or on some of the smaller but equally challenging lesser known courses. 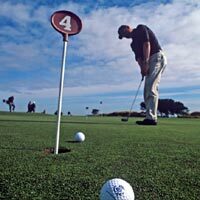 Golf programmes are best tailor-made for individual delegates as required. This might include a full itinerary of accommodation, excursions, and transportation, or may just include 1 or 2 elements. Accommodation can be arranged according to your preference, in a 5 star luxury hotel, small country house hotel or private guest house. Please note that most tee-times diaries for May 2006 open at the end of November and early booking is advisable in order to avoid disappointment. Possibly the world's leading and most famous golfing destination, St Andrews is built on public land and warmly welcomes visiting golfers from all over the world. It is every golfer's dream to play there and sample the atmosphere, beauty and true Scottish hospitality of this historic town. Depending on availability, accommodation can be booked at the Old Course Hotel, St Andrews Bay Golf _ Spa hotel or other more budget hotels nearby. The Old Course Hotel has its own course, the Dukes course and other courses include the New course and Jubilee. As the Old Course is a publicly owned course, golfers need to register beforehand by ballot which can be massively oversubscribed - so there is a real need to be there early! An original handicap certificate might be required. Golf has been played on or around the present links for nearly 500 years. Carnoustie now has three outstanding courses, the most famous being the Championship where The British Open Championship has now been played six times and is due to be played in 2007. This is a tough golf course that few have tamed. Carnoustie is truly a great challenge to the able golfer. Gleneagles is located in the heart of Perthshire, just one hour's drive from Edinburgh. Whether leading pro or enthusiastic beginner, the Gleneagles courses are a test for any golfer. There are four courses to choose from - the King's, the Queen's, the nine hole Wee Course and the exceptional PGA Centenary Course, which is the Ryder Cup venue for 2014. These courses are set in some of the most spectacular scenery in Scotland. 45 minutes from Edinburgh, Gullane, with its 300 year history, is home to three courses. It offers championship quality links courses with dramatic views across the Firth of Forth to Edinburgh and Fife. Turnberry is a luxury 5 star property which overlooks the famous Ailsa golf course and has stunning coastal views. As well as being known for its fantastic golf facilities, which include 2 18-hole courses _ the Colin Montgomery Golf Academy, Turnberry is renowned for its spa facilities. Visitors will depart from Edinburgh and will journey westwards. Their journey will initially take them past Loch Lomond, visiting the beautiful picture-postcard village of Luss. Their journey will then continue towards Inveraray, where a visit will be arranged to Inveraray Castle. Guests will continue on their journey, passing through the spectacular countryside of Rannoch Moor before entering Glencoe. Then, guests will travel to Oban from where they will board a ferry for the crossing to Mull. Upon arrival in Craignure, they will journey towards the delightful fishing port of Tobermory, one of the most picturesque villages in Scotland where they will visit the island's distillery. From the Glencoe area, visitors will journey towards Inverness. Their route will take them past some wonderful sites - Spean Bridge, the Nevis mountain range and Fort Augustus, and of course, the world renowned Loch Ness and Urquhart Castle. To the east of Inverness, they will visit Cawdor Castle, the impressive 14th century castle of the Thanes of Cawdor and reputedly Macbeth's castle. Guests will continue eastwards with plenty of shopping opportunities and a trip to a highland distillery. The route back to Edinburgh will take them from the highlands, past the Cairngorm Mountains, through the Perthshire hills before returning to the gentle countryside of the central belt, and a visit to Blair Castle. Accommodation will be in 4 star properties throughout. Please note that the booking deadline for this tour was 27 March 2006. If you wish to book this tour, we will endeavour to accommodate you, although pricing may vary from that originally published depending on accommodation availability.